Cauliflower pizza crust recipe that is gluten free, firm, soft on the inside and perfectly crispy on the outside. Easy and quick to make with a variety of toppings. Can be made vegan! This crust holds together wonderfully. So you wanna make a salad....you don't have much time.... or maybe you just want to get in touch with your food. Either way, this salad is simple, delicious and fast to make. Enjoy! Rio or chop your kale leaves into a bowl. Toss with your lemon or vinegar and add olive oil to taste about 1/8 of a cup. If you are using raw garlic add it on top now and add salt and pepper to your liking. Begin to massage the salad with your hands by crunching, smooshing and mixing the greens together. Do this for about 2 to 3 minutes until the greens have broken down and are much smaller than when you started. Taste test and see if you need more salt or pepper or any other spices that you would like to add. Eat and enjoy. Dont forget to lick your fingers! Massaging helps make the Kale more digestible and palatable. Try it with other greens too! That moment when you come home after a long day and dinner is made for you...and it's healthy and delicious at that (don't get me wrong. I've embarrassingly had fries for dinner in my life). 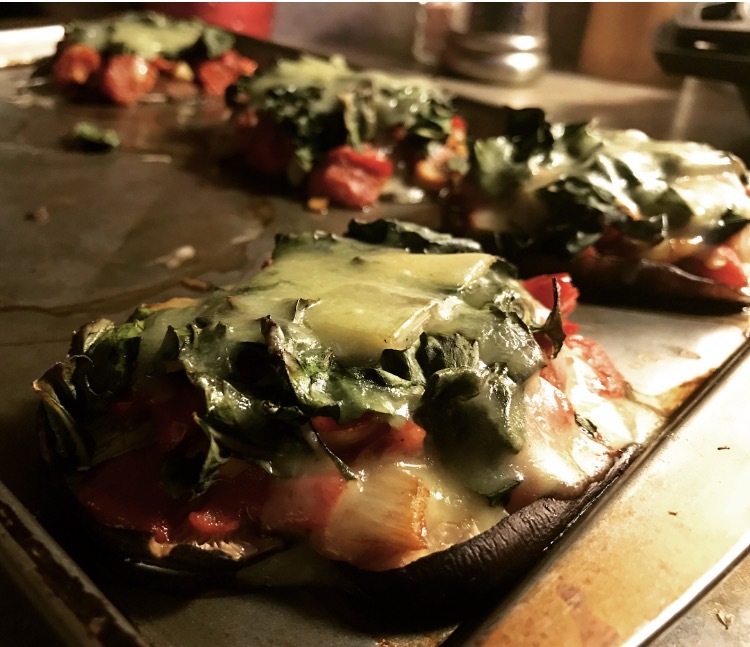 These Mushroom Pizza Pockets are the perfect hearty yet clean meal for a tough week. -Mushrooms (duh). Big ones! Portabella or shiitake work best. I used shiitake because they kickass. -Veggie toppings. I used chard and tomato then garnished with raw jalepeños and cilantro. -Cheese. Totally optional. I used a raw goat cheese. Put mushrooms on big cookie sheet and talk like Cookie Monster while doing so. Top with desired veggies. Bake until everything looks cooked. Then remove from the stove and top with grated cheese if you're going for the dairy. Put them back in the oven for about 2 more minutes. Remember, a watched pot never boils. Remove from the oven (for good this time) and top with desired toppings. Eat, slurp, get seconds. Enjoy! This is one of my favorite meals for a busy night. It's simple, delicious and very grounding. Great for times when you're stressed! Root vegetables are naturally very grounding and relaxing to our body, making them an excellent choice meal for stressful, busy days. Sweet vegetables are also naturally calming and grounding so choosing veggies like sweet potatoes, parsnips or beets (both sweet and root veggies!) can create a very satisfying meal. To top it off, sweet root vegetables can help get rid of low energy and sugar cravings! Stir the oil and oregano in a large bowl. Add yams, carrots, parsnips, and onions and toss to coat. Sprinkle vegetables generously with sea salt and pepper and then spread them on baking sheets. Roast veggies until tender and brown in spots, turning occasionally, for about 50 minutes. This dish can be made up to 4 hours ahead. Let it stand at room temperature. If desired, re-warm in 350ºF oven for about 15 minutes, or serve at room temperature. Also great stored in the fridge as leftovers. Also great as cold topping for salad or rice the following day. YUM! EnJOY! These veggie burgers are absolutely delicious. They use the okara, which is the dry pulp of the soybean that's left over after you make soy milk. It's absolutely loaded with protein and fiber. I love ravioli and pasta. When I went vegan, giving up cheesy pasta and noodles was really hard. Then I discovered homemade ravioli! And wa-la! I can make them healthy, vegan, gluten free, you name it. I'm sharing my squash ravioli recipe with you today so you can make these tasty tidbits too. Warning: They are addicting and delicious! Raw Burritos - A stand alone entree or complimentary side dish! Quick, easy and healthy. Three of my favorite things when it comes to food. These burritos are all three- and as a bonus, they are absolutely delicious. Raw (and Deliciously Divine) Lasagna! I made this recipe for the Nutrition Cooking Class I taught at Ringling College and it was delicious! It was easy, tasty and quite filling. Plus, I felt wonderfully light after eating it, unlike how heavy and tired I feel after eating regular lasagna. Raw, healthy, delicious... What's not to love? Okay, it doesn't taste exactly liked a box of kraft or Annie's, but we already know that stuff isn't too great for us anyway and this recipe is both yummy and good for you. Plus it's super easy and quick to make!